No wonder raccoons are born wearing masks. Watch as this furry thief stealthily steals a donut and onlookers cheer it on. Peter Jensen captured something that most of us will never see. A raccoon, in plain sight, sneakily scales down between the ceiling tiles of a coffee shop and swipes a donut. The theft took place in the city of Toronto, Canada, and had the paying customers on the other side of the counter cheering it on. 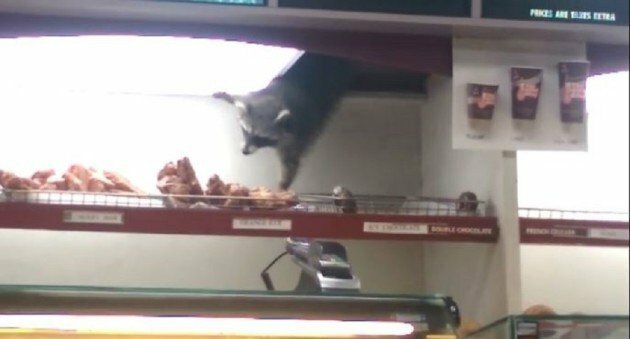 Much as we are indecisive when it comes to choosing our favorite treat, this raccoon took its time as well - ultimately deciding on an orange donut before making a quick getaway back up into the ceiling. Be prepared to laugh at this coffee shop crime of the century. Kind of makes you wonder when the last time the health inspector paid this place a visit. Our hats off to you, Mr. Raccoon. You pulled this theft off flawlessly. NEXT: WHO KNEW TOM TURKEYS TOOK PUBLIC TRANSIT?